A mom (and Internet friend of mine) asked this question in the “Ask me anything” Facebook page (check it out if you want to read updates from my family, recipes, tips and articles I love). I was so happy she asked this particular question as I know that many mothers struggle with this problem and I want to help you by sharing my ideas on this topic, which are longer than a Facebook post. But first, let’s briefly talk about WHY cereal is not one the healthiest foods out there and WHY we all (not only our children) should be eating less of it. Most cereal has high amounts of sugar and preservatives and lacks protein and fat. Sugary foods spike blood sugar levels which in turn forces the pancreas to produce insulin. When we eat sugary foods on a regular basis for months and years in a row (and many of our kids do this), the pancreas becomes tired and can’t secrete enough insulin to deal with the high level of sugar circulating in blood. This is when type II diabetes occurs. Sugar intake causes a high followed by a crash which makes kids crave more sugar. This cycle of highs and lows in blood sugar levels plays a big role in daily tantrums, fatigue and brain fog that our children experience at home or at school. So let’s see how to prevent all the above from happening and to help our kids have even moods. There are a few ways to wean your child off cereal, depending on your comfort and of course, your child’s comfort. Here are a few methods I propose. You can come up with your own methods. No method is wrong, as long as you and your entire family can happily apply them. The best method is the one you can consistently apply within your family, without your family complaining. The second way is to slowly decrease the number of days per week your child eats cereal from a box. Based on working with parents and picky eaters, I know this is the method most parents choose as it’s the least aggressive and less likely to freak kids out, especially kids who depend on their morning cereal. If your child is old enough to understand, have a brief conversation with them about what you are planning to do. Explain why boxed cereal is not an ideal breakfast food and tell them how variety in their foods keeps their body healthy and strong. Even more, show them how much sugar there is in one serving of their favourite cereal, keeping in mind that 1 teaspoon equals 4 grams of sugar. Finally, propose a few methods they can choose from to slowly decrease cereal consumption and decide together on a plan to follow through. a. Choose 2 or 3 days a week when your child eats another breakfast food. Talk to your child about it and come up with a few delicious ideas together. Even better, write the ideas on a piece of paper that you stick to your fridge so no one forgets. Loaded chia chocolate breakfast pudding – this is another breakfast recipe loaded with nutrients. I make this at least once every 2 weeks and we all devour it each time. Homemade Holy Crap – inspired by the store-bought product with the same name, this cereal keeps very well in the fridge for weeks. I make a triple batch so all we have to do in the morning is to mix it with our favourite milk, almond milk. Green Omelette – this recipe takes a bit of time to make. What I like to do is either make it on a weekend day or prepare it the night before and store it in the fridge. All I have to do in the morning is to cook it in a frying pan. French Toast – I use 2 giant pans so I make enough French toast for all of us to eat together. b. Your child will still continue to eat cereal, but add small amounts of nuts, dried fruit, oats, chia seeds, hemp seeds, coconut flakes, cinnamon, etc. to it. As more and more extra ingredients are accepted and eaten, slowly decrease the amount of cereal until no cereal is eaten. c. Replace the current cereal with a healthier version by following one of the above tips. Have your child try a few other boxed cereal following 4 main label rules: less ingredients, less sugar, no dyes and less unknown ingredients. Go shopping together, read labels and then decide on a new cereal to try based on these 4 rules. You can also go to http://www.ewg.org/foodscores to check what grade your child’s favourite cereal gets (cereal gets a grade based on nutrition, ingredients and processing) and to find healthier alternatives. My kids eat cereal once a month or so and they usually get it as dessert after dinner, never for breakfast. I consider that giving breakfast cereal in the morning is basically giving my kids straight up sugar (and other unwanted ingredients), no matter how much fiber or other marketing gimmicks are mentioned on the box. So I prefer to offer it to them seldom and not for breakfast. I have been known to take a little bag with a variety of cereal to a birthday party for my son to eat instead of the birthday cake since he can’t have too much gluten and dairy. That particular birthday party happened after 3 other birthday parties (all within a period of 2 weeks) where he had plenty of pizza and cake. After so much partying, his body couldn’t handle any more gluten and dairy and he started showing symptoms. So we agreed that he wouldn’t eat the birthday cake at the 4th birthday party and he would get cereal instead. He quickly and happily agreed as he considers cereal a major treat. 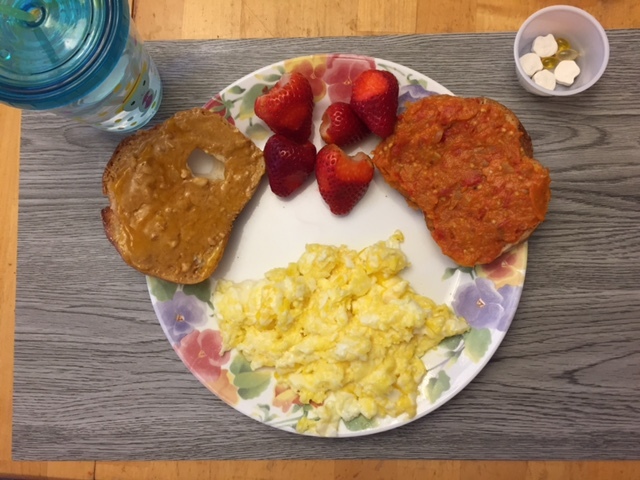 I want the breakfast my kids eat to keep them full and happy for a long time, especially during school days when they don’t have enough time (as I have been told by my son) to sit down and eat a proper meal at school as they play with their friends instead. 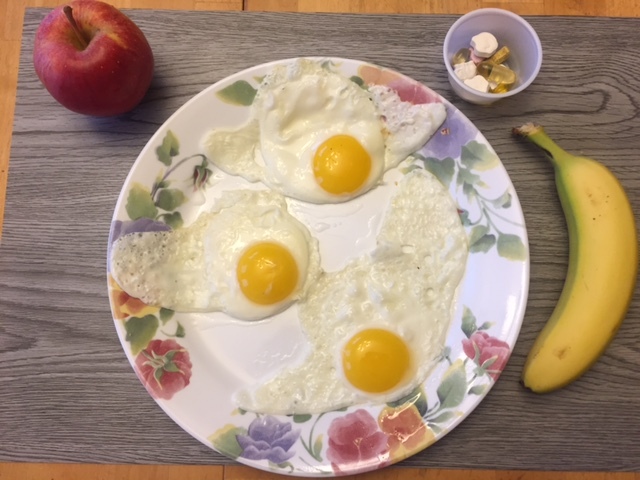 Here are a few photos I shared on Facebook of some of the breakfasts my almost 8-year old son eats. My almost 5-year old daughter eats the same things, but in smaller amounts. If you think that what you see in the last photo are frogs, you are not wrong. This is a photo of frogs (given to us by a family friend) cooked with cornmeal. This is an indeed an exception. I have not tasted the frogs as my kids ate them all. 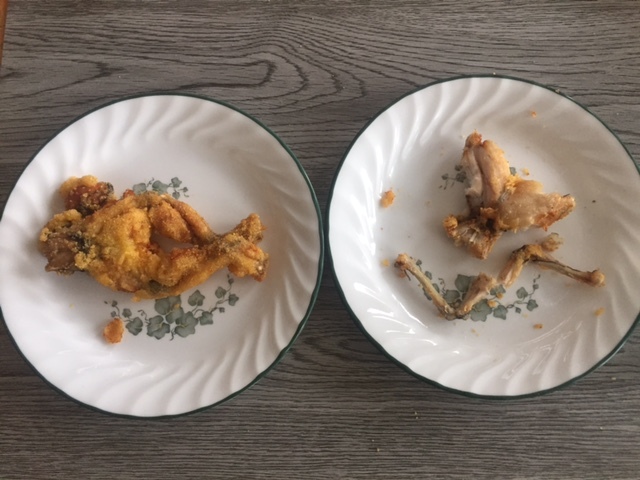 My daughter ate the frog on the right for breakfast and my son ate the other one after school as he already had already eaten breakfast the morning the frogs were brought to our house. If you are wondering, they both enjoyed the frogs very much. When I was growing up in Romania I never ate cereal, pancakes or waffles for breakfast. They weren’t available, so I never ate them. Naturally, I don’t consider them breakfast foods. After studying nutrition, I decided not to offer them to my kids in the morning. They need to eat filling foods, rich in healthy fat and protein to keep them full for a long time (and not be hungry 1 hour after eating) and to prevent highs and lows in their blood sugar. This in turn keeps their mood stable and helps them have an easy time focusing and memorizing what they learn in school. I am lucky (and it took quite a bit of perseverance) that my kids are eating almost anything I offer them. It hasn’t been always easy, especially when they were smaller and they were still figuring out the house rules when it comes to eating. But they reached a point where they know what’s what and they roll with it without complaining (most of the time). This is what we do in our house and this is what works great with my kids, my husband and myself. Every family is different. Everybody has different rules in their home and what works for some children and parents doesn’t work for others. The foods we eat might be different than the foods you eat. And that’s okay. There isn’t only one right way to feed kids. If we strive to give our kids healthy choices most of the time, then we do this parenting job the right way. It’s not always easy, but it sure is rewarding when we get there. My hope with this is that if you have been thinking of lowering the amount of cereal your child eats, then hopefully the ideas I shared with you help you find a non-threatening and friendly way so your child doesn’t push back (too much). Breakfast doesn’t have to always mean cereal. Breakfast foods don’t have to always be store-bought cereal, pancakes or waffles. They can be anything you want them to be. Even frogs. As I mentioned before on the blog, I was a very picky eater for the first 25 years of my life (and a terrible cook). While I am now definitely far from where I was, my kids are even better eaters than I am now (they just ate those frogs without batting an eyelid!). If a picky eater (me) can train her kids to eat a wide variety of tasty and nutritious foods, then YOU can definitely do whatever YOU put your mind to. I realize that if your child is older than let’s say 3 or 4 years, it’s going to be harder to make a change in their eating habits. But I can assure you that it’s not impossible. And if you try any of the methods above and they still don’t work, please drop me a line. I am always happy to answer any questions that come my way. Do you struggle with how much cereal your child eats? Do you wish they ate less of it? What do you think about the methods above? Would you and your child try any of them? What about the cereals that don’t have added sugar? For example puff wheat. The kids and i aren’t big cereal eaters, we love oatmeal and eggs. I’m going to try the chia pudding though! Claire, cereal is a processed food. Some are more processed than others. 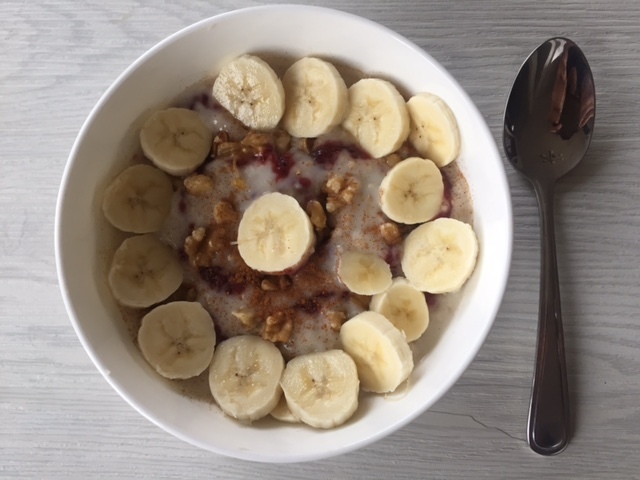 Cereal without added sugar is definitely better than cereal with added sugar. And puffed wheat is a good option. 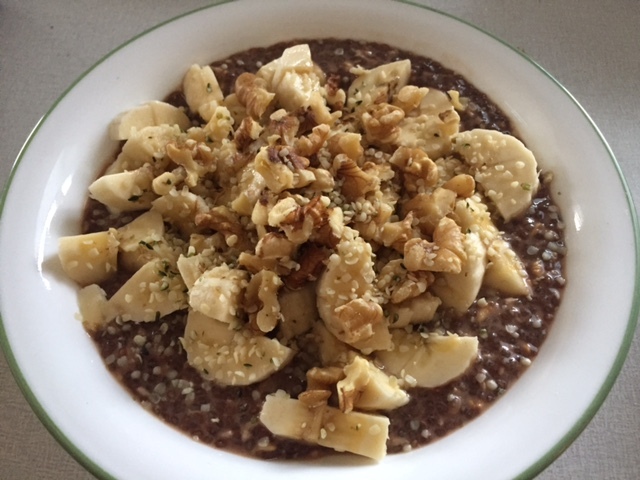 I hope you like the chia pudding! You can add or omit any ingredients you add to make it for your family’s taste. Great tips! Thankfully my mom never allowed sugary cereals in our house, which means the most exotic cereal we ever had was Cheerios or Corn Flakes. I’m still a huge fan of basic low-sugar cereals! I agree, Coleen. Low-sugar cereal is the way to go.